If you are looking for a change of pace from the hectic city life you will find a quiet, peaceful and comfortable home away from home. Curl up with a good book. Prepare an old fashioned home cooked meal in our great kitchen or just relax sitting on the front porch taking in the countryside. If you are looking for an active vacation exploring the beautiful Lehigh Valley, you will find yourself centrally located. North, South, East or West their is lots to do and lots to see all year round and just minutes away. Spring: Golf, Cycling, Whitewater rafting, Baseball at Coca Cola Park. Summer: Golf, Cycling, Dorney Park and Wild Water Kingdom, Musik-fest, Country Fairs, Drive-In Theatres. Fall: Golf, Cycling, Wine Tours, Jim Thorpe and Fall Foliage all around you. Winter: Skiing, snowboarding. Visit downtown Bethlehem at Christmas time. Outlet shopping at the Crossings. Looking forward to you staying with us! Keywords: This is a early 1900s Craftsman style farmhouse with Queen-Ann features. Just remodeled. 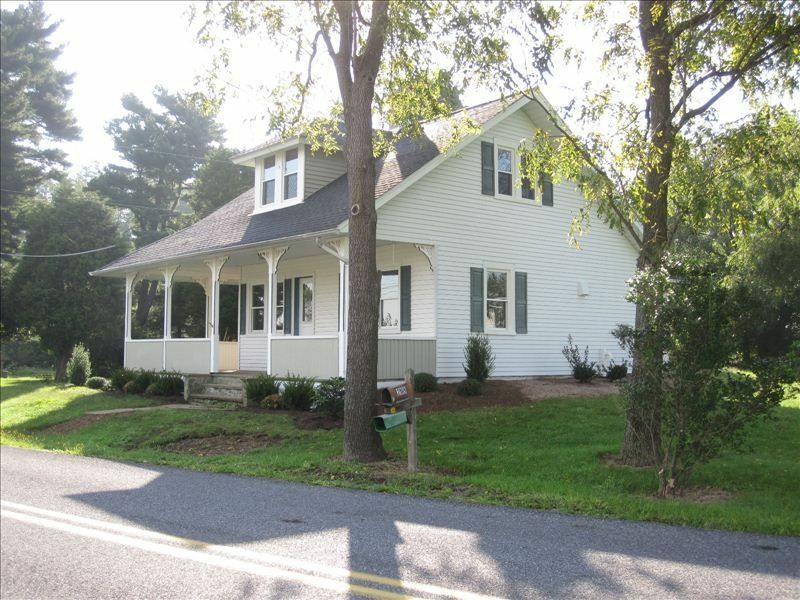 Located in a charming country setting; with panoramic views from the wrap around porch. Dennis 'the Hay Man' and wife, Louise, third generation farmers, along with their three sons love to share this country experience with those who always wanted to experience life down on the farm. Great location to all attractions in the Lehigh Valley area. Minutes from PA Turnpike, Routes 145, 309, 248, 22 and Interstate 78. *** Property address for GPS purposes is 2118 Rising Sun Road, Slatington, PA 18080. Full bathroom is located on the 1st floor. This rental wasn’t a great option for my family. Although generally in decent condition, it wasn’t cleaned thoroughly and I found several dead bugs and spiderwebs. Plates and dishes were clean but many of the other kitchen items (pans, utensils, etc.) were put away dirty in the cabinets. I also had trouble getting in touch with the owners leading up to my stay. I had some basic questions about check in, linens, etc. I said to my husband as we were packing that we might end up in a hotel last minute if we aren’t able to enter the property. The day before check in their assistant provided a phone number and once I had that no trouble at all getting in touch. So maybe they don’t check the app messages? Excellent house for our family ski getaway! Convenient location and close to Blue Mountain. We enjoyed our stay. The house is within close drive to grocery stores, restaurants, and Blue Mountain. It has all the amenities one would need. The kitchen was nice, bathroom was clean, washer and dryer worked as they should, it’s a nice property... no complaints! My husband and I along with my sister spent a long weekend at The Great Escape. My sister and I are originally from the area and we return twice a year to visit our family. We felt at home right away! The house was perfect for preparing meals and seating everyone comfortably. We had warm weather and enjoyed the front porch on Sunday afternoon. The views of the surrounding area are beautiful. My sister’s dog had a great yard for his walks. We look forward to returning in the spring! Enjoyed our stay greatly and would highly recommend it. Our family stayed at the farm house to attend a family reunion nearby. We found it to be clean and comfortable. The location was convenient to popular attractions yet remote enough to peaceful and quiet. We would definately stay again. Very affordable and worth every penny. A positive experience all around. Close to the following towns or local attractions: Blue Mountain Ski, Jim Thorpe, Dorney Park, Allentown Fair Grounds, Bethlehem Sands Casino, Musikfest, Beltzville State Park, Coca Cola Park home of the Iron Pigs...Just to name a few. Check in time is 3:00pm. Check out time is 11:00am. This is a non-smoking rental. Guests are permitted to smoke outside on the porch. Renter must be 21 years of age.